The Mousterian of Acheulian tradition (MTA) describes a group of industries characterized by usually small and finely retouched bifaces, first recognized by Peyrony in 1920. Different regional variants of the MTA have been distinguished according to the presence of bifaces with a peculiar morphology (MTA with triangular bifaces within northern France, MTA with bout-coupé form unique to Britain, MTA with cordiform bifaces in the south-west of France). The MTA is an excellent example to demonstrate the ongoing use of the concept of “fossil directeurs” (index fossils) in the Prehistoric archaeology. Here I display a triangular Handaxe from Saint Sauveur (Vienne). 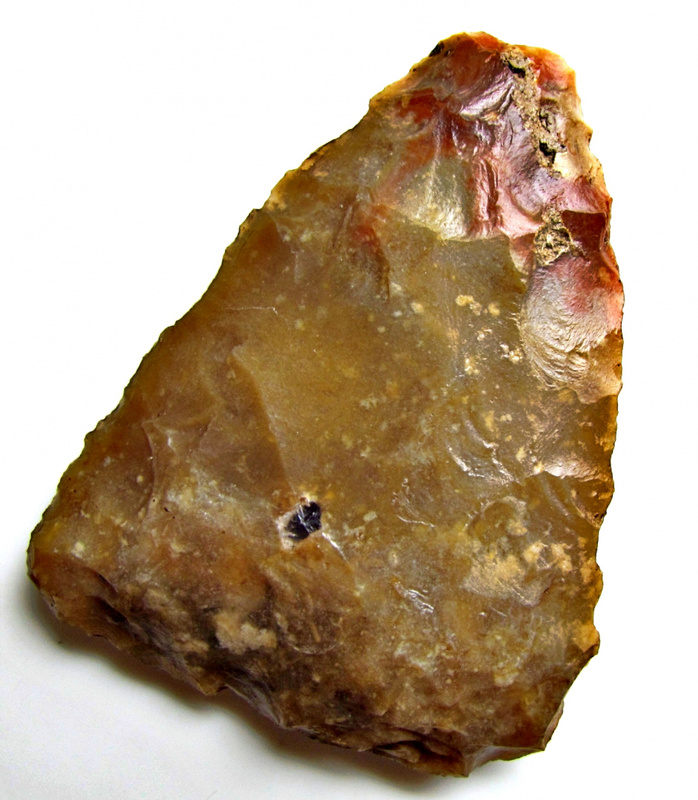 It is made of a very compact and homogeneous Turonian (“Grand Pressigny”) flint, not only found at Saint-Sauveur but also occasionally in the Creuse valley, south of Abilly, and in the valley to the Claise at Chaumussay. Nicholas Steno established the theoretical basis for stratigraphy when he reintroduced the law of superposition and introduced the principle of original horizontality and the principle of lateral continuity in a 1669 work on the fossilization of organic remains in layers of sediment. The first practical large-scale application of stratigraphy was by William Smith in the 1790s and early 19th century. Smith created the first geologic map of England and first recognized the significance of strata or rock layering and the importance of index fossils for correlating strata. An other influential application of stratigraphy in the early 19th century was a study by Georges Cuvier and Alexandre Brongniart of the geology of the region around Paris. Soon after the establishment of human antiquity during the 1850ies, John Lubbock (1834–1913) provided his colleagues with a useful chronological tool. He divided the prehistoric Stone Age into two Periods: the Palaeolithic period or Old Stone Age (which he initially called the “Archaeolithic”), characterized by chipped stone tools; and the Neolithic period or New Stone Age, when polished axes and domestic animals appeared . Without stratigraphy, Paleolithic prehistory as a scientific discipline would not have been emerged during the second half of the 19th century, as stratigraphy was the only established approach of relative dating Paleolithic complexes. It was not by chance that a geologist, Gabriel de Mortillet (1873), supplied a further refinement of Lubbock’s Palaeolithic period with his stone tool epochs, each named after a typical locality (Chellean, Mousterian, Solutrean, Magdalenian, etc.) and defined by typical tool-forms which acted like the type-fossils (fossil- directeurs”) of geologists. During the first half of the 20th century, Paleolithic archaeology in France was dominated by influential ecclesiastic “master thinkers” like Henry Breuil. Breuil and others, notably Denis Peyrony, a renowned excavator in southwestern France, still relied on the concept of type fossils as the basis for their chronologies. But while Mortillet had used the index-fossils as proof of an unilinear and universal progression of mankind, Breuil and others interpreted them as indicative of unique cultural traditions characterizing “Paleolithic tribes” (for example the “Perigordians”). In other words, if specific cultural traditions are associated with only one type of artifact tradition, then artifacts can be understood to ‘behave’ like paleontological phyla. Francois Bordes in collaboration with Maurice Bourgon introduced simple statistical methods into the research of Middle Paleolithic industries in the late 1940ies. Basically he first developed a rigorous type-list. This list explicitly used morphological and technological characteristics of the tools in the determination of type. In addition, he created a cumulative graphical method to display the characteristics of excavated ensembles. By calculating the relative percentages of different tool types within Mousterian assemblages, he finally developed a series of technological indices that was used to characterize assemblages without the use of “fossil directeurs”. Bordes’ taxonomy was widely recognized for its utility and its emphasis on quantitative data (assumed to be objective in nature) as opposed to qualitative data (assumed to be subjective). In reality, however, Bordes’ approach was not merely a simple quantitative scheme. He routinely used qualitative criteria to refine his taxonomy. The MTA facies, for example, was defined purely in terms of the presence of the distinctive hand-axe (cordiform, triangular). The use of the hand-axe to define the MTA was made solely on the grounds of the tool as a purported diagnostic type, not because of its relative frequency in the assemblage or its role in any of the technological indices created by Bordes. Here the fossil directeur was re-introduced by the back door again. Deeply influenced by Peyrony and Breuil, Bordes adhered to a culture historic approach. By the early 1960s, he routinely used the term “tribe” to refer to the different cultural groups he posited as the makers of the different Mousterian tool industries. Although later generations of Archaeologists dismantled the naïve cultural historic concepts and discredited the type fossil approach, one has to ask if the “New Archeology” did not throw out the baby with the bath water. The question that has to be answered for 150 years has still not resolved: Why did humans in a defined area within a defined timeframe choose to produce triangular handaxes? In Europe such artifacts have never been used before or later again. The MTA in S/W-France is dated to OIS3 and the MTA with triangular bifaces of N-France has been traditionally dated on geochronological grounds between OIS 5d–5a. In contrast, newer excavations at Saint-Amand-les-Eaux revealed a remarkable ensemble of 80 bifaces (cordiform, triangular) produced and used at the site, preserved in situ and dated to 50 k.a. BP (OIS3). More information about triangular Bifaces in Europe can be found here: 1536 and 2027 .